Established in the year 2011, we, Kandru Eye Wear Private Limited, are a well-known exporter, supplier, wholesaler, trader and importer of an optimum quality collection of Designer Reading Glasses, Kids Reading Glasses, Metal Reading Glasses, Contact Lenses, Ophthalmic Lenses, Shell Optical Frames, Half Rim Optical Frames, Full Rim Optical Frames, Rimless Optical Frames, Metal Optical Frames, Fashion Optical Frames, Plastic Sun Glasses, Half Rim Sun Glasses, Kids Sun Glasses, Metal Sun Glasses, Sports Sun Glasses and Full Rim Sun Glasses. The provided products are accurately designed and fabricated using superior quality material and modern technology as per the international quality standards. Also, our professionals use advanced machinery and latest tools in the production process of our presented products. All these products are highly appreciated in the market owing to features such as crack resistant, lightweight, elegant design, long life, durability, attractive looks and stylish appearance. Moreover, we provide our product variety in various sizes, colours, designs and shapes as per the specific needs of customers. We have a well-resourced infrastructure unit that is equipped with our up to date machines, equipments and tools in conformity with advanced technology. We have hired knowledgeable and highly skilled team of professionals, who have huge knowledge in their respective domains. Our team of professionals assist us to provide finest quality assortment in compliance with the latest market trends. All the members of our team work round the clock in order to achieve the predefined aims of the association. Further, varied training programs are carried out at our association at regular intervals to maintain our personnel familiar with the modern techniques and equipments. With the help of our brilliant team workers, we have been delivering the best quality range of products. The presented products are designed and fabricated using premium quality material and latest technology under the supervision of our experienced professionals. Further, our trained quality auditors check the products on different quality parameters using sophisticated testing tools to ensure flawlessness. 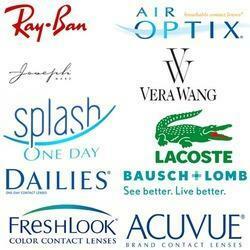 We deals in following Brands Ray Ban, Splash, Dailies, FreshLook, Acuvue, Lacoste, Vera Wang and Air Optix. Our association is efficiently managed by our mentor, Mr. K. H. Kumar, who holds huge experience and knowledge in this domain. His sound administrative qualities and huge knowledge have helped us in maintaining our reputation in the market. We are amid the primary providers of this commendable variety of optical frames and glasses. For the purpose of offering fulfillment to our clients, our vendor engross in using the best grade quality raw material and latest machines in constructing process that is carried out in accordance with the industry set norms and guidelines. Owing to this, the offered variety has a commendable functionality and longer service life. We are engaged with a strong and reliable vendor base involved in manufacturing and supplying of superior quality products and raw materials. Our vendors have top notch technology tools and machines which enable them to source the products to satisfy the customers. The products can be customized to meet the higher satisfaction of the patrons. Our vendor base enables us to manufacture and supply best grade quality products which are acknowledged by the customers. It is owing to the firm commitment on behalf of best industry experts that we have been capable to continuously provide our customers with best quality of products. The sincerity of our experts and their prompt response to the queries of our customers has been appreciated by our patrons, which has help to gathering high level of client satisfaction.